This is a supplement for the World Wide Wrestling Roleplaying Game. 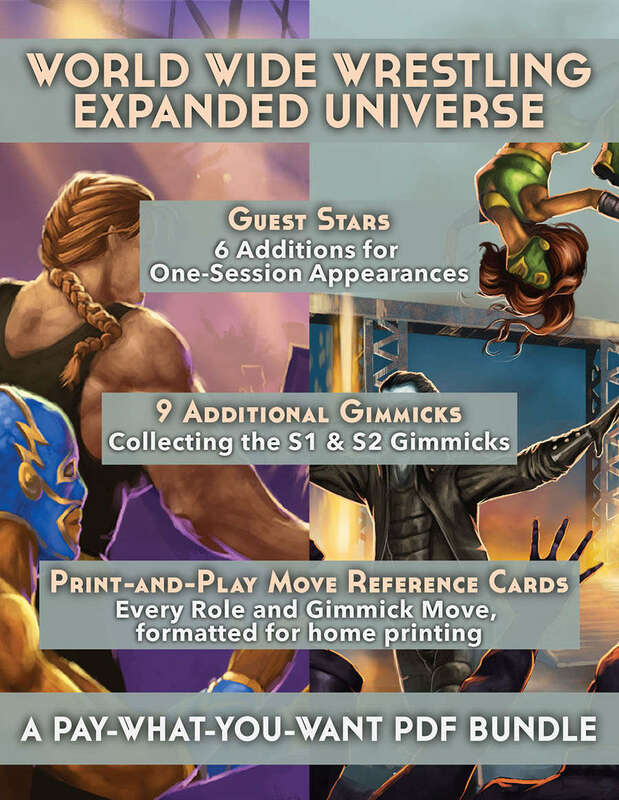 It contains the previously available Season One Gimmicks, the Season Two Gimmicks and Guest Star PDFs, as well as adding print-and-play Move Cards. A mini-supplement to support playing one-shot appearances, whether for players who can only appear for one Episode, or for return players to try something new. A new Advanced Role, The Part-Timer. The Part-Timer "retired" but just can't quit the business. Back to work a specific program, will the Part-Timer's creative control clause enable a legendary victory lap or a forgettable nostalgia run? The Athlete: You are blessed with natural physical gifts, but you still have a lot to learn about how the business works. The audience finds it easy to connect with you, but other wrestlers don’t appreciate how you make it look so...easy. The Clown: You are the quintessential entertainer. You bring comedy to the ring and grease the wheels backstage. You may not have many championships, but you move a lot of merch. Is that enough for you? The Gatekeeper: You’re the strong right arm, the enforcer, the one they have to get through to get to the top competitor. You put on great matches, but are you content with your second place on the card? The Giant: You’re one of the largest athletes on the planet. You can draw full houses and lots of attention, but it’s a continual struggle to hold yourself back and make others look good. How long can you be a team player? The Provocateur: You’re the sui generis, the strange one, the weirdo. Whether you’ve been saddled with this role or you’ve sought it out, you’re great at pushing boundaries. But will you go too far? The Iconoclast: You’re a gunslinger, a giant-killer, a career-ender. Your talents are wasted on jabronis; your prey are the greatest heroes and vilest villains that the wrestling universe has to offer. You will forge your own legend from the broken bodies and shattered egos of past greats…until the day that you become the legend to be taken down. The Time Bomb: The business has taken its toll on your body. Held together by steel, screws, and sheer will, you probably should have hung it up by now but the child support payments, money you owe to your “pharmacist”, or your own hubris keep you stepping back into the ring. When will you take your final 3 count? The Foreigner: Yer not from here. Yer from SOMEWHERE ELSE! You’re not sure what it says about pro wrestling that “from another country” is still a valid character, but you keep getting paid to make it work. Who will tire of your retrograde act first, you or the crowd? The Boss: You’re in charge. Maybe you’ve made your name in the ring, you’re the legit head of the corporation or you just play the boss on TV. Regardless, you have the power to make the rules, punish those who cross you and elevate those who you think are the real future of the business. Will you make the right decisions? Containing the same information as the printed Move Deck, this PDF is all of the Gimmick and Role Moves from everything published for World Wide Wrestling to date, formatted to print and cut yourself on a home printer. Use these cards to keep track of the Moves your wrestler takes as they gain experience in the ring, or to build a new custom Gimmick around. Ramon Villalobos, JB Roe, Niki P.